Why do I chase storms? The three most common questions I get when I tell people I chase storms are: Isn’t it dangerous?, How? and Why? The first one I usually respond with: “Yes, a little bit but not much more dangerous than skiing”. The second, How?, I usually explain like in my previous blog post. The last one, the most important question, is Why? So, why do I chase storms? I would like the photo above to explain it all but I guess it doesn’t. For me it represents some of the essence of storm chasing. That feeling of looking at something that does not belong on this planet. It’s like waking up one day and see that our planet has got rings like on Saturnus. And, if Earth would get planetary rings, would you not go out and have a look? For me it is the same, the videos and photos I have seen of tornadoes and supercells – and the ones I have seen myself – brings me to an endless fascination about how our world is set up. It just blows my mind! The few times I have had intense encounters with severe weather and especially tornadoes that stretch from the ground all the way up into the sky like a twisting pillar of destruction – it really gives me a feeling of insignificance. It gives me a glimpse of realizing how tiny we are on this rock floating through space. That may not sound as a particularly positive thing but watching the extremes of the planet we live on somehow gives me a greater understanding of the universe. I can find a similar fascination to other things in nature (I love nature and wild animals when I travel) but not at the same level. So, that is the core reason to why I chase storms but I have grown to appreciate a lot other factors as well. I love the visual beauty of it. 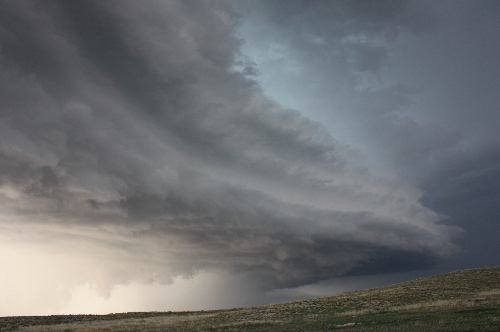 Even reducing the whole philosophical part of chasing storms I just find supercells and tornadoes incredibly beautiful. The rounded shape and striated layers of an LP super cell or a white, roped-out tornado is just amazing! I love the adrenalin rush and the power of the storms. Yes, the adrenalin is an important part of it but it is only a fraction of my love for storm chasing. Still, the anticipation of waking up to a day with good potential, driving up to a storm that is firing up and waiting for a rotating wall cloud to produce a tornado gets my heart pumping. Knowing the power of a tornado (or large hail and lightning for that sake) adds to the thrill. I love how sciency storm chasing is. There is so much to learn about forecasting, how storms behave and how to predict what is going to happen next. I am a learnoholic and and an engineer and love to find out how it all comes together and I love the challenge of it, because it sure is not easy. I love the travel part of it. The US Midwest is not the prettiest place in the US in my opinion but it really has a specific charm. When you chase storms you visit places that no one would ever really go to. You end up in small towns in Kansas that rarely get any visitors, you drive through ghost towns, you bump into people that have not seen a tourist in their area before and you experience the vast fields and the endless skies they bring. In one way it is the essence of adventure travelling since you go wherever the trips leads you to. I love the people I meet. People sharing the same hobby usually get along because they have something to talk passionately about. You meet interesting people you travel and chase with and you meet fun people when you stop at gas stations waiting for storms to pop up. After chasing a few seasons I have found myself bumping into people I know in random fields and places all over the Midwest (not completely random though, we all chase the same storms). I love, and hate, how unpredictable storm chasing is. I guess it is the same psychological factor as with watching football. You have no idea how things will end – you can be bust or you can win big. There is also “Yet, another day” to try again if you miss…or, in worst case, another season.